I read this article and found it very interesting, thought it might be something for you. The article is called Budget 2018: After Record Growth, India’s Renewables Progress Slips and is located at https://archive.indiaspend.com/cover-story/budget-2018-after-record-growth-indias-renewables-progress-slips-38743. In line with its climate-change commitments and domestic pollution concerns, India has one of the world’s largest programmes to expand renewables–a tripling of capacity over the next five years. But after two years of record expansion, the diversion of a national clean-energy cess to subsidise GST (goods and services tax)-induced losses and a new import duty to protect domestic manufacturers of solar equipment threaten to derail India’s ambitious 2022 target. This is why February 1, 2018–the day the ruling Bharatiya Janata Party (BJP) will present its last full budget before the 2019 general elections–is of particular significance to the renewables sector, which comprises electricity from solar, wind, hydro and bio power. These are the issues the budget must contend with: India has missed yearly renewable expansion targets since 2016; no more than 29% of the clean energy cess–a major source for funding renewables in the country–has been spent over six years, with Rs 56,700 crore diverted in 2017 to subsidise GST losses; a new import duty on solar modules from China, Taiwan and Malaysia threatens to increase production costs and record low solar tariffs; and the rural poor may miss a renewables job boom, if a workforce cannot be trained. Addressing these issues are important if India is to fulfill its commitment to the Paris Climate Agreement 2015 to install 175 gigawatt (GW) of renewables power capacity by 2022. This is enough to replace 175 coal-fired power plants of 1,000 MW and reduce India’s dependence on fossil fuels–92% of India’s electricity comes from fossil fuels–that produce greenhouse gases and hasten global warming. Of India’s 2022 renewables target, 100 GW is supposed to come from solar and 60 GW from wind power, according to government data. India installed 62 GW renewable power capacity by November 2017, of which 27 GW, or 43.5%, was installed over four years from May 2014. Consequently, budgetary allocations to renewable energy rose by 38.9% between 2014-15 and 2017-18. By November 2017, renewables constituted 18% of India’s installed power capacity of 331 GW, up from 13% in 2014, when the BJP government took office. But over two years to 2017, India missed its ambitious targets substantially. During 2017-18, 4.8 GW renewables capacity was added till November 30, 2017, against a target of over 14 GW, according to a government release published by the Press Information Bureau (PIB) on December 27, 2017. India will now have to add nearly 3 GW every month–the amount it did over four months previously–to meet its target by the end of March 2018. India added 11.31 GW of grid-connected power-generation capacity from renewables during 2016-17 against a target of 16.66 GW, which means it fell 32% short of target. During 2016-17, India added 5.5 GW of wind-power capacity–its largest addition ever–exceeding the target by 38%. However, since then till November 2017, India fell short of its target by 88%, adding 0.46 GW instead of 4 GW. Similarly, India added 5.52 GW–the largest ever–of solar-power capacity till November 2017, but missed its target of 10 GW for 2017-18 by 44.8%. Rooftop solar projects are supposed to provide 40% (40 GW) of India’s solar target of 100 GW by 2022. The government has sanctioned 1.7 GW of such projects and no more than 0.86 GW capacity has been installed in 2017. At this rate, it will take up to 2064 to meet the 2022 target. To protect domestic manufacturers, India has proposed a 70% duty on solar cells and modules imported from China, Taiwan and Malaysia, which currently supply 90% of India’s requirements. India’s annual domestic manufacturing capacity for solar cells is about 3 GW, or 15% of the country’s requirement of 20 GW. 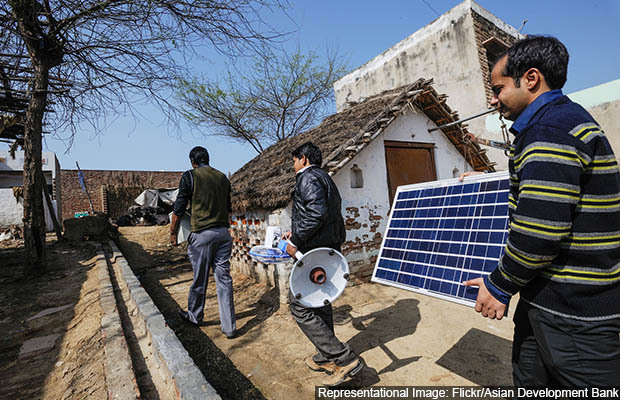 A capacity of one watt costs about Rs 62 for India-made solar cells and it costs nearly Rs 25 for Chinese solar cells. India saw record-low solar and wind tariffs in 2017, lower than the rate of power generated by coal-based project. The lowest solar tariff recorded was Rs 2.44 per unit of electricity and Rs 2.64 per unit for wind, compared to Rs 3.20 for coal-fired power. The National Clean Energy and Environment Fund (NCEEF) was created in 2010-11 using a carbon tax–a clean-energy cess on coal charged to coal producers and importers–to fund clean-energy projects nationwide. But the fund has not been used as it should have been. Rs 53,967.23 crore was collected as clean-energy cess over six years to 2016-17. Of this, no more than Rs 15,483.21 crore (28.7%) had been transferred to the NCEEF, according to a December 2017 audit report issued by the Comptroller and Auditor General, the government’s auditor. An additional Rs 29,700 crore should be collected by March 2018, according to government data. A little over a third of the money collected by the government as clean-energy cess has been transferred to the NCEEF, and less than Rs 7,000 crore was spent on projects. Unspent NCEEF money of Rs 56,700 crore is being diverted to compensate for losses incurred during the rollout of the GST in 2017, revealed a July 2017 response to a right to information (RTI) request filed by the website Scroll.in. NCEEF has been a major source of funding for the ministry of new and renewable energy (MNRE) since 2011. In the budget for 2017-18, 97.6% of the MNRE’s budget came from the NCEEF. In the absence of the NCEEF fund, budget 2018-19 will reveal how India intends to fund its renewable-energy drive. India wants to provide electricity to 240 million people without grid power, improve the quality of electricity supply and boost per capita energy consumption, which at 1,075 kwh (2015-16) is a third of the global average. Energy subsidies play a major role in achieving these goals, as IndiaSpend reported on January 8, 2018, and will determine not just future power choices but pollution trends as well. Fossil fuels currently provide 92% of India’s electricity, and are mainly responsible for worsening air pollution, morbidity and mortality, as IndiaSpend reported on July 29, 2017. While India declares it wants to increase the share of renewables, the greatest chunk of energy subsidies still favour fossil fuels, according to a 2017 study by the International Institute of Sustainable Development (IISD) and the Overseas Development Institute, both think tanks, and ICF India, a consultancy. No more than 6.9% of India’s Rs 1.35 lakh crore energy subsidies for 2015-16 went to renewables. “The government should also take care that the prices of fossil fuels including kerosene and LPG are competitively determined and level playing field being created for renewables,” Vibhuti Garg, associate, IISD, and co-author of the report told IndiaSpend. India’s clean-energy push to triple renewables over the next five years can generate 330,000 jobs, but this won’t be possible without a skilling programme, IndiaSpend reported on December 20, 2017. Many training programmes are in urban centers, which makes it difficult for the rural poor to enroll. Housework, childcare and social norms make it nearly impossible for women to join training programmes. Even if they overcome all these challenges, the curricula of training institutes do not often align with industry needs, we reported. Apart from addressing these challenges, some may need budgetary attention. This is the first of an eight-part series of State of the Nation reports ahead of Budget 2018. You can read our report on agriculture here, on urban development here, on rural jobs here, on healthcare here, on education here, on defence here and on sanitation here.